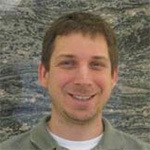 Former CDAC student Jeff Pigott, who received his PhD degree at Ohio State University under the supervision of Academic Partner Wendy Panero, has been awarded an Agnew National Security Postdoctoral Fellowship at Los Alamos National Laboratory. He will be working with Nenad Velisavljevic on developing methods for the measurement of thermal equations of state of hcp metals. For the last two years, Jeff has been a NSF Postdoctoral Fellow in the group of James van Orman at Case Western Reserve University, and will take up his position at Los Alamos starting in April 2018. For the next 10 months, Jeff will be learning first principles theory with the computational chemistry group at the University of Western Australia in Perth. Congratulations to Jeff on receiving this outstanding award!